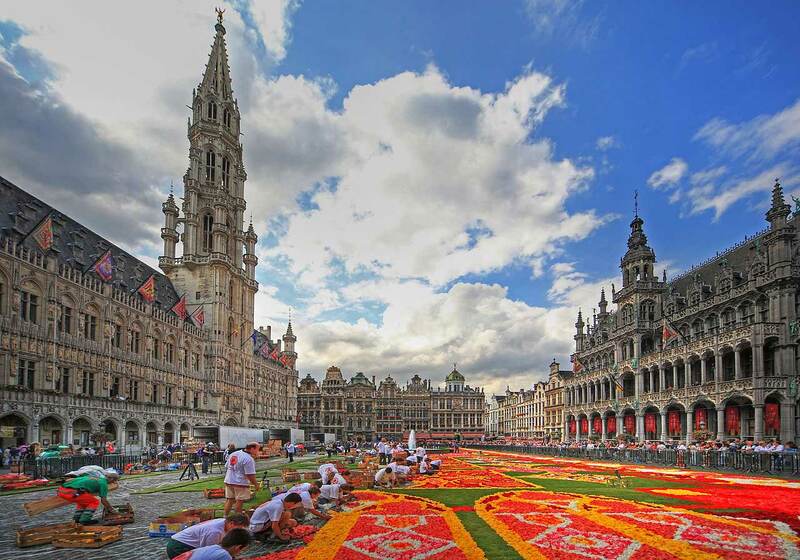 Brussels Flower Carpet is an event taking place in Brussels every two years. 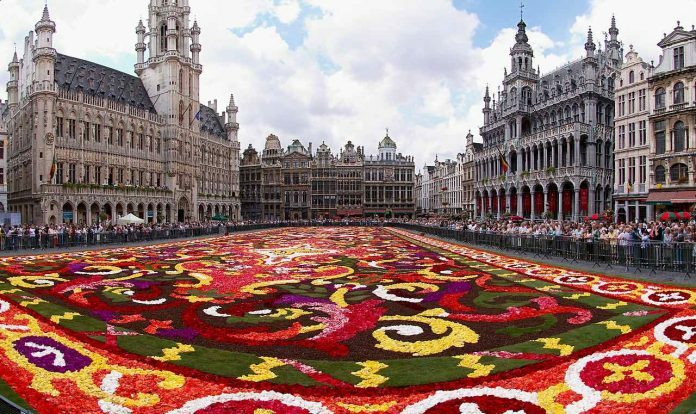 In just one morning, Belgian begonia cultivators decorate 1,800 m2 of Brussels' Grand-Place with a beautiful floral carpet using over 600,000 begonias. Brussels Flower Carpet is an event taking place in Brussels every two years during the third week of August, to coincide with the Assumption Day. In just one morning, Belgian begonia cultivators decorate 1,800 m2 of Brussels’ Grand-Place with a beautiful floral carpet using over 600,000 begonias depicting a theme (in 2018 the theme was be “Guanajuato, cultural pride of Mexico”). Around 300 begonias per square meter are assembled, flower-by-flower, by over 100 volunteers. The first Flower Carpet in Brussels was created in 1971 by landscape architect Etienne Stautemas, who started experimenting with smaller flower tapestries in the 1950s and created his first flower carpet in his hometown of Zottegem in 1965. The Grand-Place (Grote Markt in Dutch) is a UNESCO World Heritage Site and is a fabulous example of Gothic architecture, surrounded by opulent guildhalls, the City Hall and the King’s House (Maison du Roi/Broodhuis), today a museum. Entrance to the Grand-Place is free but for a panoramic view of the Flower Carpet you can buy a ticket to the City Hall’s balcony (€6, free for children under 10). Official opening with sound and light show: 13 August, 10.00 p.m.
Sound and light show: 13-16 August, 9.30-11.00 p.m.